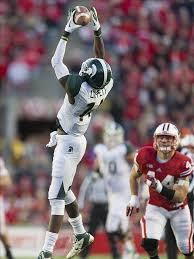 WR Tony Lippett, Michigan State 6’ 3” 185 lbs. Cons: The receiver is a long strider, who takes more than a few steps to get to full speed. He also needs to chop his feet to breakdown while he ran crossing routes. After Lippett secured the ball, unless he had a lot of open space, the wide out did not stretch the field. In the middle of the field, the former Spartan got the ball punched out of his hands while trying to complete the catch on a few occasions. He needs to do a better job attacking the ball in the air instead of letting it drop to him. I didn’t see a receiver that could make defenses game plan against him, but a safe, consistent target. Pros: Lippett is a smooth receiver who can run the entire route tree, including deeper patterns where he is deceptively quick. He is physical off the line of scrimmage, fighting thru the jam. The former Spartan wins down the field by securing contested throws, hand fighting back to the ball and by boxing out defensive backs. This makes him an effective red zone threat. The wide out adjusts well to the ball in the air, and can create some separation through crisp route running. He has good hands, keeps his feet, and can fight thru arm tackles. Lippett spends most of his time lined up on the outside, but occasionally works out of the slot. The receiver uses a stiff-arm to keep defenders off his body, makes bucket catches down the field, and has the concentration to make sure both feet tap in bounds. Lippett knows where he is on the field and gives an extra effort to secure a first down or get into the end zone. He is an adequate run blocker. Overall thoughts: When I look at Lippett, I see Titan receiver Nate Washington, a solid professional who could be an NFL WR2 or WR3. In a pass-first offense, he could have WR3 dynasty value, but he might be more of a reserve fantasy receiver if he ends up in a more conservative offense. If you have a taxi squad, this could be a great stash receiver for you. « Cody Prewitt: Aggressive enough or too aggressive?